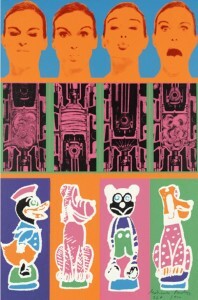 Eduardo Paolozzi, the son of Italian parents, was born in Edinburgh in 1924. In 1943 he studied at the College of Art in Edinburgh in 1944 at the St Martin’s School of Art and finally at the Slade School of Art in Oxford from 1945 to 1947. Paolozzi spent the years between 1947 and 1949 in Paris, where he became aquainted with Arp, Brancusi, Giacometti and Léger and dealt with Surrealism as well as ‘art brut’. Paolozzi later became co-founder of the “Independent Group” in London in 1952/53, which discussed thoughts of including trivial culture and that way gave decisive impulses for the development of English Pop-Art. At that time Paolozzi began to be known in foreign countries, in 1952 and 1960 he participated in the Venice Biennale and in 1959 in the documenta II in Kassel. His early sculptures of the late 1950s were totem-like archetypes of the age of technology in the form of plump robots, but Paolozzi’s work changed radically in 1961 when he began using prefabricated aluminium and brass casting moulds. The demonic element was replaced by a homage to modern machines and technology. Paolozzi was not only a sculptor; he also produced graphic art and pottery, made films and was a successful writer. Paolozzi taught textile design at the Central School of Art and Design in London from 1949 to 1955 and changed to the St. Martin’s School of Art in 1955. He went to Hamburg for two years to teach at the Hochschule für Bildende Künste in 1960 and between 1977 and 1981 he held a chair at the Fachhochschule in Cologne. In 1981 he switched to the Akademie der Bildenden Künste in Munich, where he taught until his retirement in 1994. Eduardo Paolozzi died in London in April 2005. Among Paolozzi’s best known works are his works for public places like the design of the tube station Tottenham Court Road in London with coloured mosaics, the realisation of the Rheingarten project in Cologne or the cast iron sculpture ‘Piscator’ for the Euston Square in London.